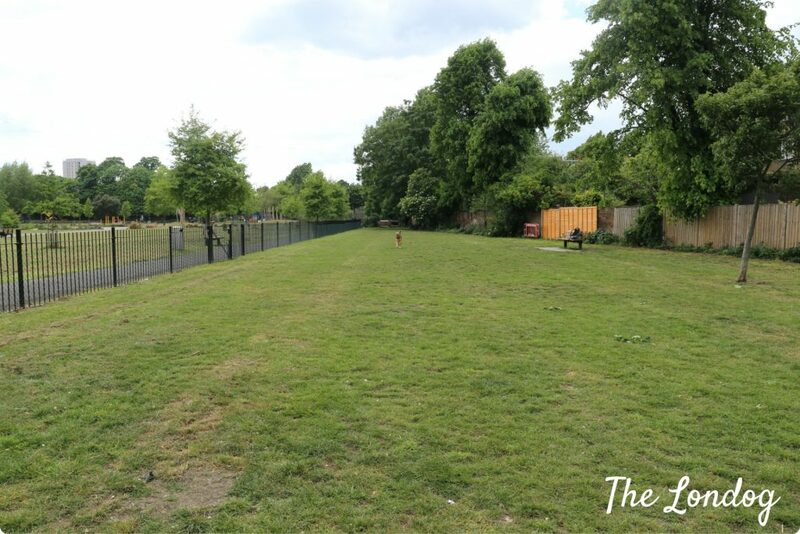 After the reviews of North London dog exercise areas, I thought to share with you our reviews of 12 enclosed dog parks located in South London. Argo and I, as usual, have visited each dog area in order to verify all information, take photos and measures and dog test them! You will also find a map at the bottom of the post. 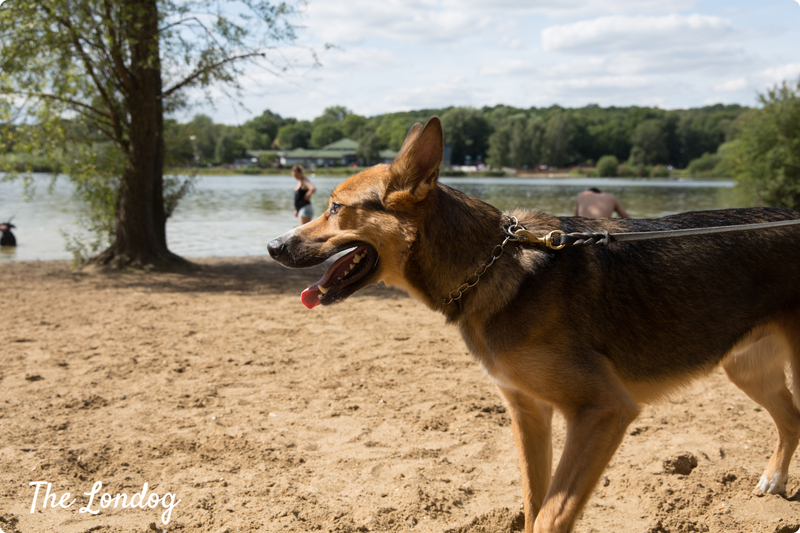 In addition, there are a few more dog parks that I will review in the next few weeks and add to this blog post. One further note. 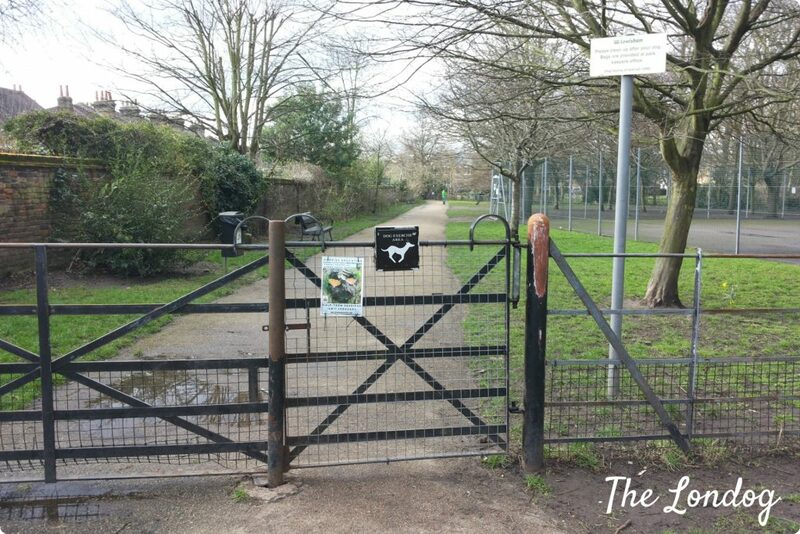 I also checked out Dulwich Park’s designated ‘dog run’, however this is not fenced off and consists in a path running around the perimeter of the park, close to the bike path, which does not make much sense to me. 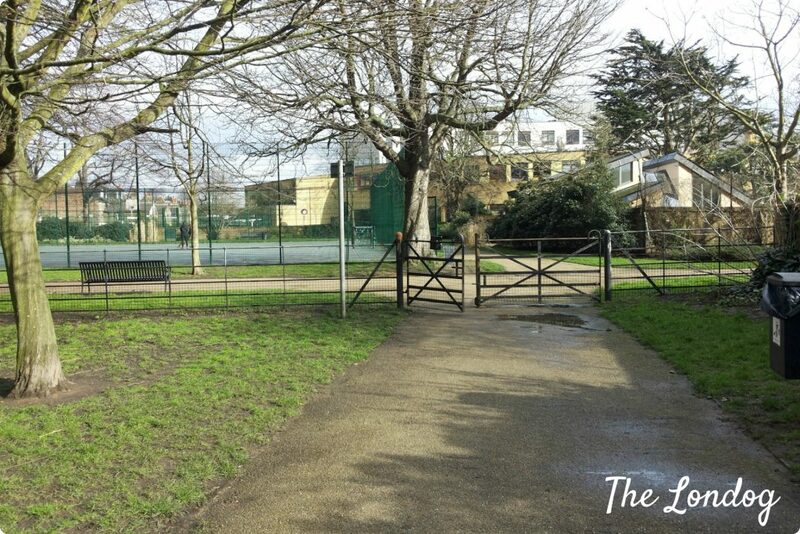 Myatt’s Fields Park hosts a large dog exercise area, next to the tennis courts. 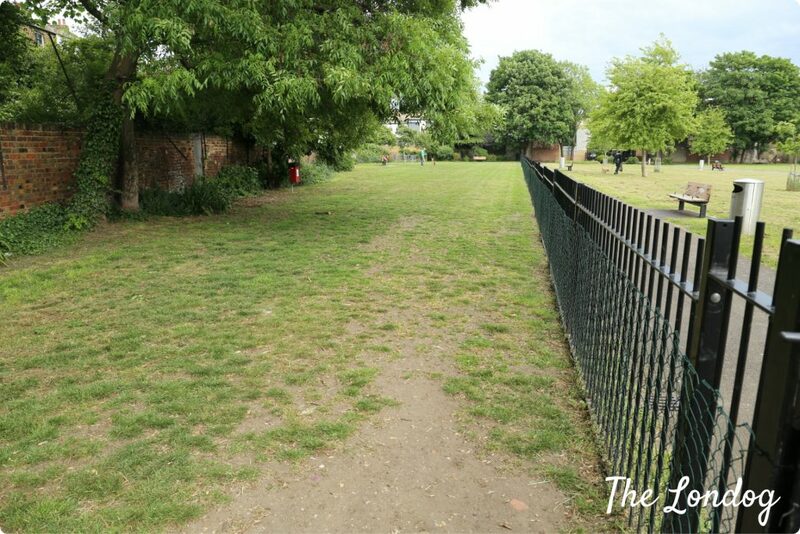 According to the information the Council provided me with about its size, the dog park measures approximately 2,500 square meters (approx. 26,910 square feet). This is one of my favourites (and Argo’s) among the dog parks we have visited so far: large, well maintained, safe and cozy! I will tell you more about it. The dog area has two gates, which locks work properly, and is enclosed by a metal fence (which has a metal frame and a net) 128 cm high (approx. 50.39 inches) on the border with the park. The net makes it safe for small dogs and I didn’t notice any gaps under the fence (the gap under the gate measures 6 cm circa, approx. 2.36 inches). The edge with Cormont Road is enclosed by a metal bar fence with a low brick wall at the bottom. The dog area also borders with the tennis court, which has a high metal fence. Of course if you have a nervous dog who does not cope well with tennis balls being thrown around in the court, it is probably a good idea to take this into account before entering the dog area, but apart from this it looks like a quiet area so you shouldn’t have any issue. 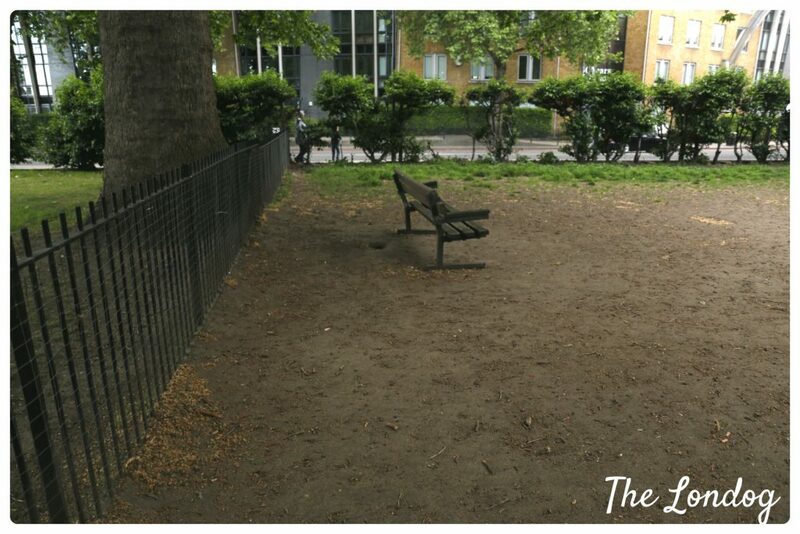 There are two benches and one dog waste bin in the dog area, which, at the time of our visit, appeared well maintained and clear from dog mess/rubbish. Argo had a great time running around and the tennis players also gave him a ball! They probably noticed that, despite me having brought his balls, he was much more interested in their tennis ones… clearly grass is always greener on the other side of the fence in his opinion! 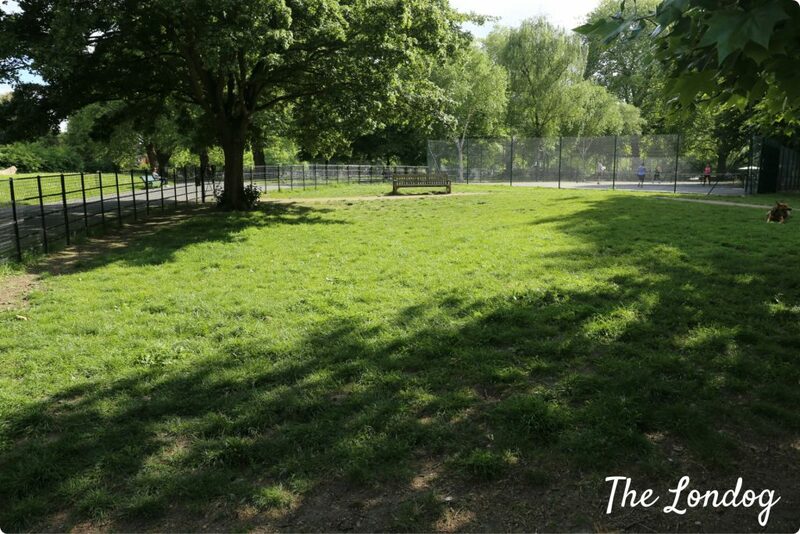 Slade Gardens are located in Stockwell and accessible from Stockwell Park Road, Brixton Road, Lorn Road and Robsart Street and the closest tube station is Stockwell (about 12 minutes walk) not too far from Myatt’s Fields Park dog exercise area either (less than 15 minutes walk). 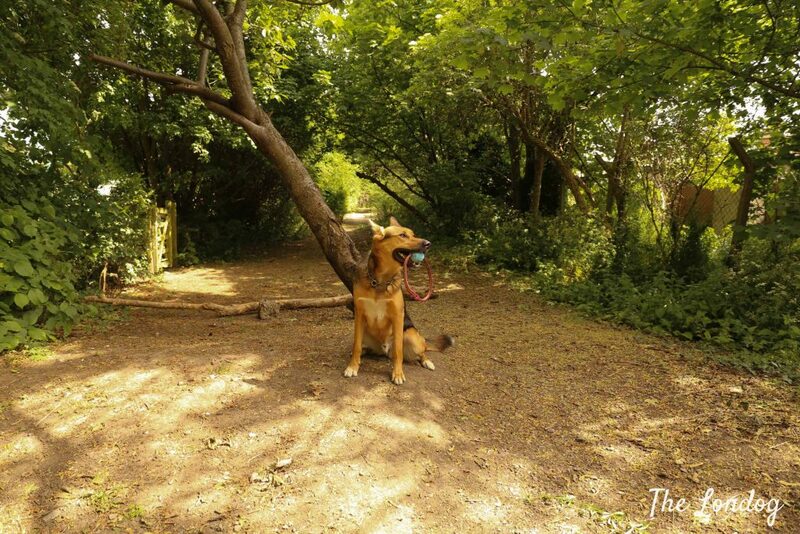 Slade Garden’s dog park is another of our favourites and it is perfect for long runs and fetch ball. 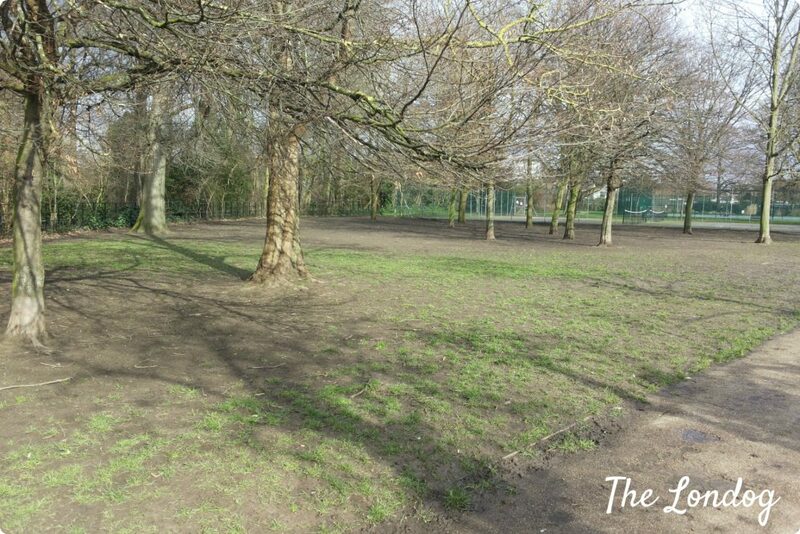 The dog exercise area, according to the information provided by the Council, measures 70 meters by 20 meters (approx. 229.5 by 65.6 feet), i.e. it is 1,400 square meters large (approx. 15,069 square feet). The fence with the rest of the park is made of metal bars and is 120 cm high (approx. 47.2 inches), plus has a stock fence (that covers about 2/3 of its height), which makes it safe for small dogs. The gap under the left gate measures 10 cm (3.93 inches). The boundary with the residential area is enclosed by a high brick wall and wooden fence. There are three gates, which locks work all fine and the area is provided with three wooden benches and two dog waste bins. The dog park is clean and well maintained. 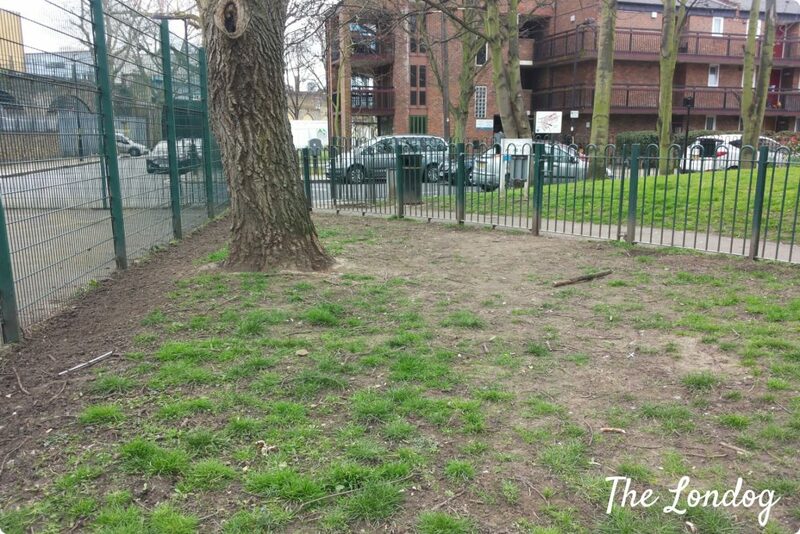 However, there are two small parts which are under maintainance works and are fenced off, and the part near the gate that is nearer to the entrance on Brixton Road has some not so well maintained shrubs (see photos below). Anyway, in my opinion, the area is so large and in general so well maintained, that these do not constitute a big issue! 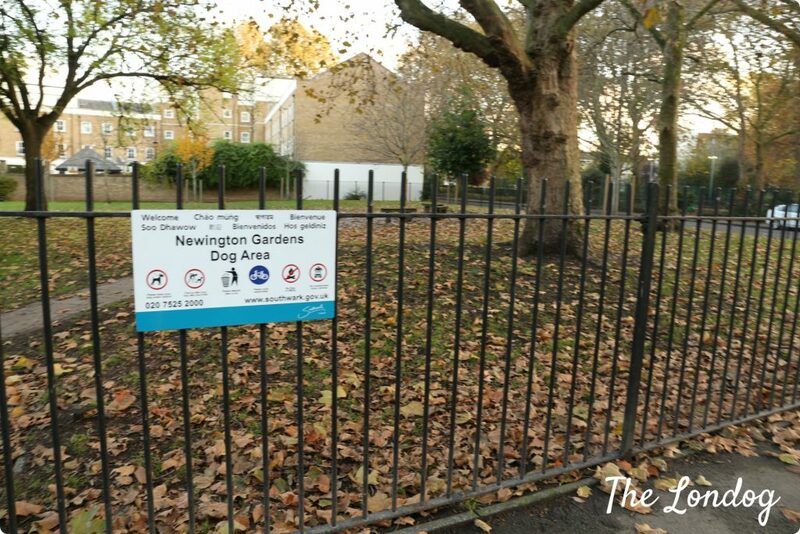 Newington Gardens host a dog area just on the other side of the road from the main gardens, with entrance on Swan Street. The dog area is enclosed by a metal bars fence 140 cm high (approx. 55.12 inches), with space between bars of 10.5 cm (approx. 4.13 inches). Under the double gate on Swan Street there is a gap of approx. 15 cm (approx. 5.9 inches), which in my opinion is quite wide. 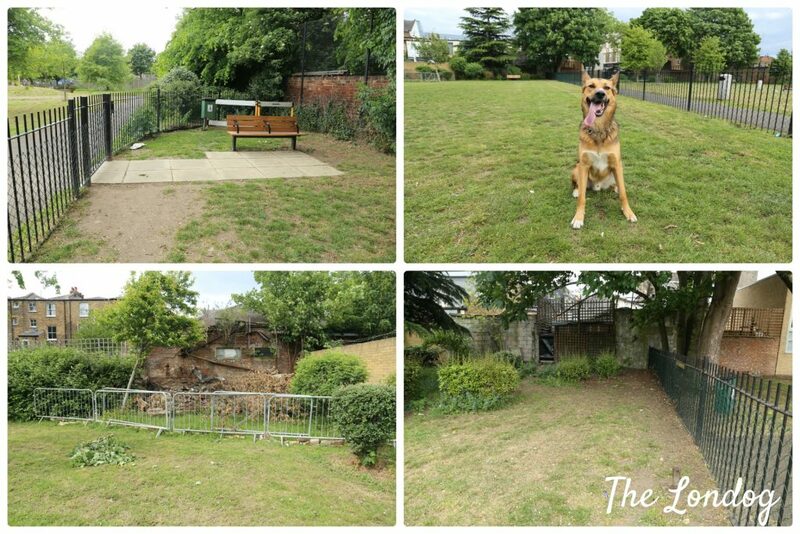 The dog park is provided with three benches and a waste bin and has two entrances, although the one on Harper Street was locked when we visited the area. There is a concrete path, a lawn, some trees and a few bushes. At the time of our visit the area appeared fairly clean and well maintained. 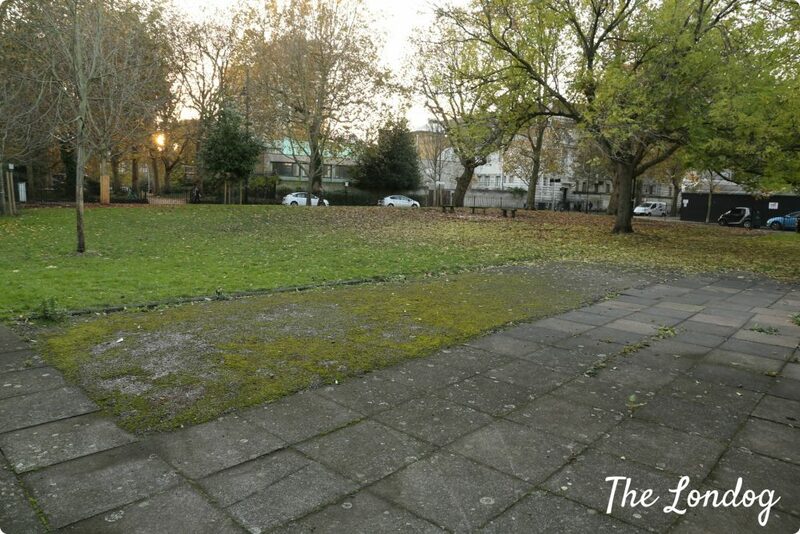 Lambeth Walk Open Space is located in Lambeth and hosts a circular dog exercise area. 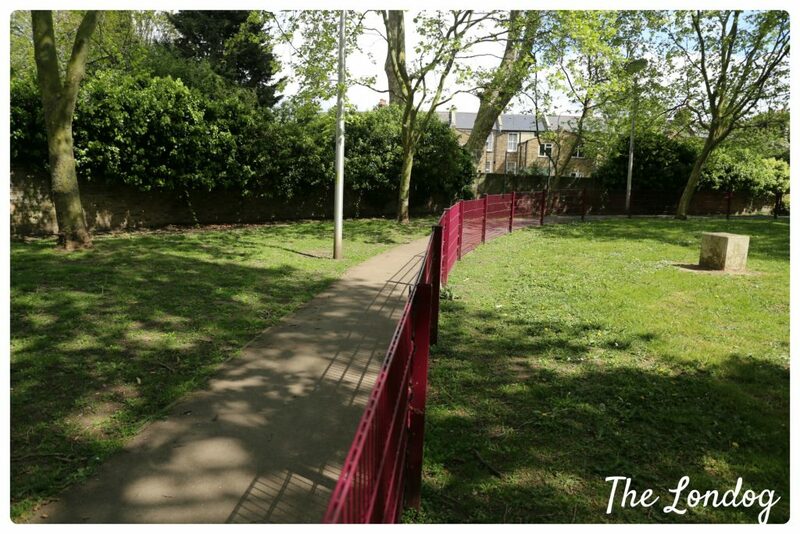 The Council confirmed that the dog area measures 15 meters (49.21 feet) by 15 meters, and the wooden fence measures from 1.5 to 2m in height. The dog area has three benches and five gates, four of which were locked, when we visited it. There is a lawn and no trees nor shrubs. 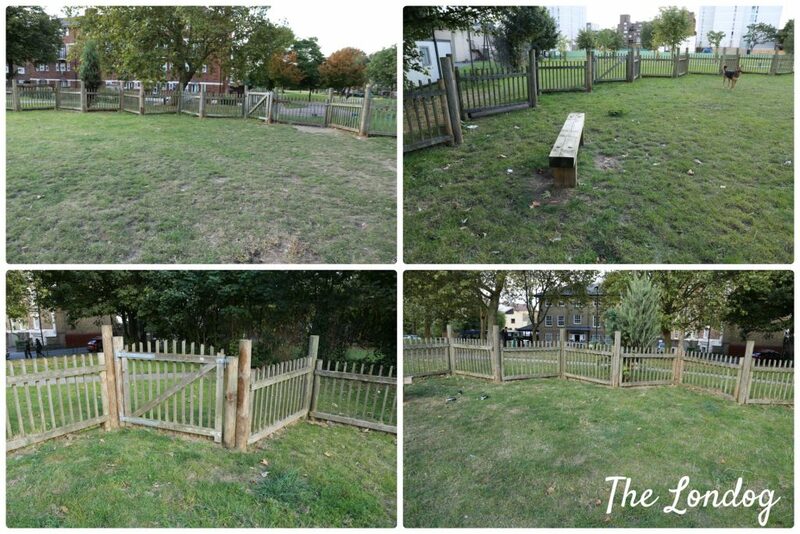 The wooden fence enclosing the dog park has a minimum height of 105 cm (approx. 41.33 inches) and spaces between the wooden fence posts measure 9.5 cm (approx. 3.74 inches). There are some barriers for small dogs, but we found a hole dug under the fence. At the time of our visit we found many empty alcoholic drinks cans left on the ground in the dog area and a few other pieces of rubbish. 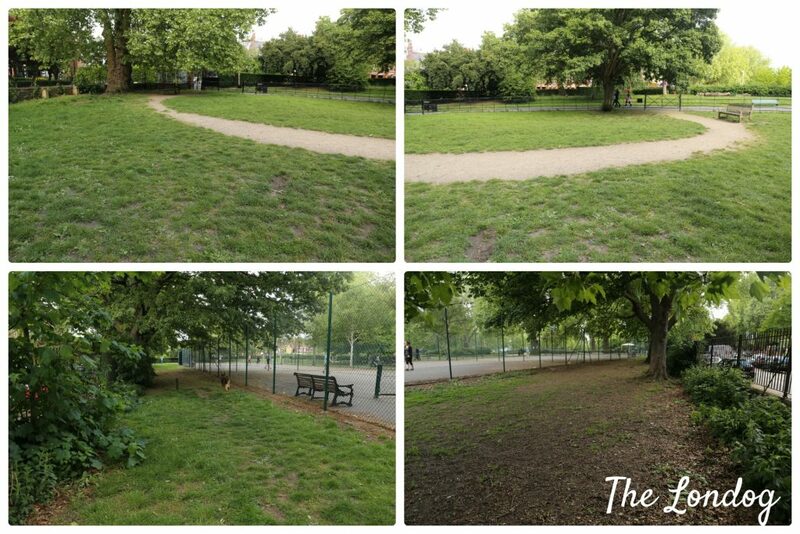 Vauxhall Park hosts a double dog exercise area side by side. According to the information provided by the Council, the larger dog area measures 25 meters (82 feet) by 15 meters (49.21 feet), while the smaller one is 15 meters by 10 meters. 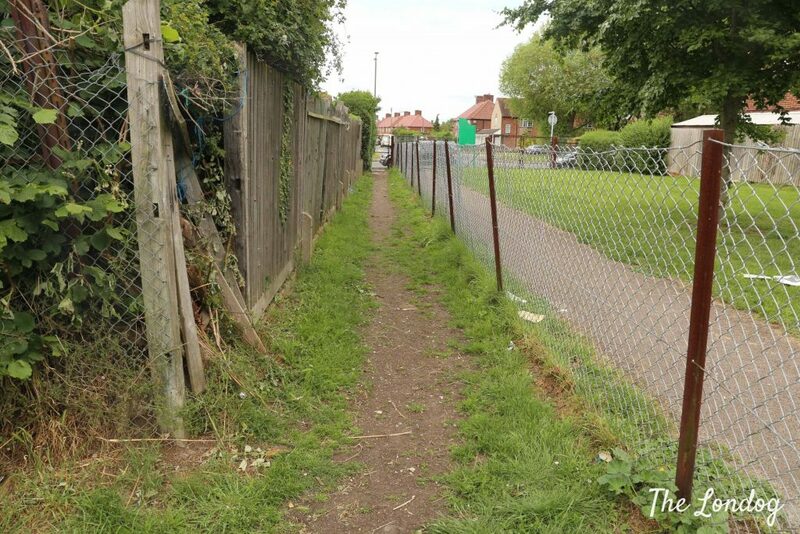 Overall we weren’t much impressed by the dog areas: although having a decent size and being relatively safe with regards to fences and gates, we found them quite dirty, with unpicked dog mess scattered around and other rubbish. They also looked quite dark being placed under some big trees. The larger area is enclosed by a metal fence with a stock fence, approx. 110 cm high (approx. 43.3 inches), while there is a high stock fence on the boundary with the road. 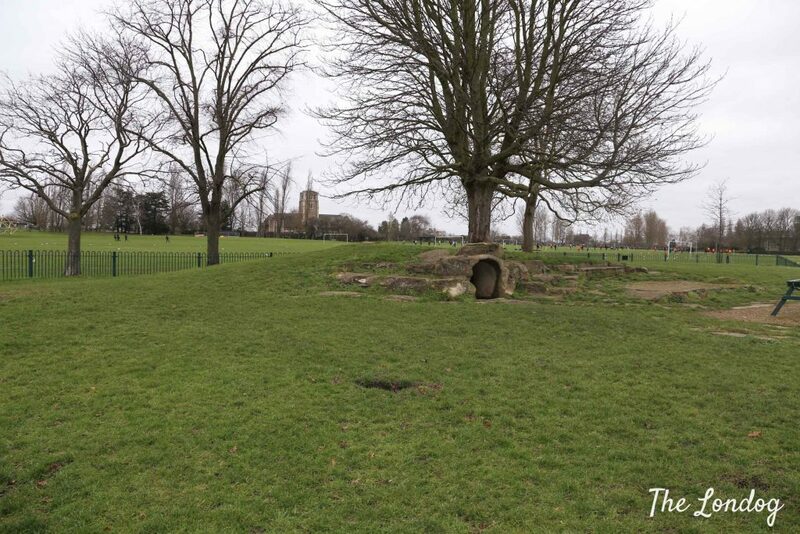 The area is provided with a bench and a dog waste bin. The area has two gates, but the one on the other dog area was locked. 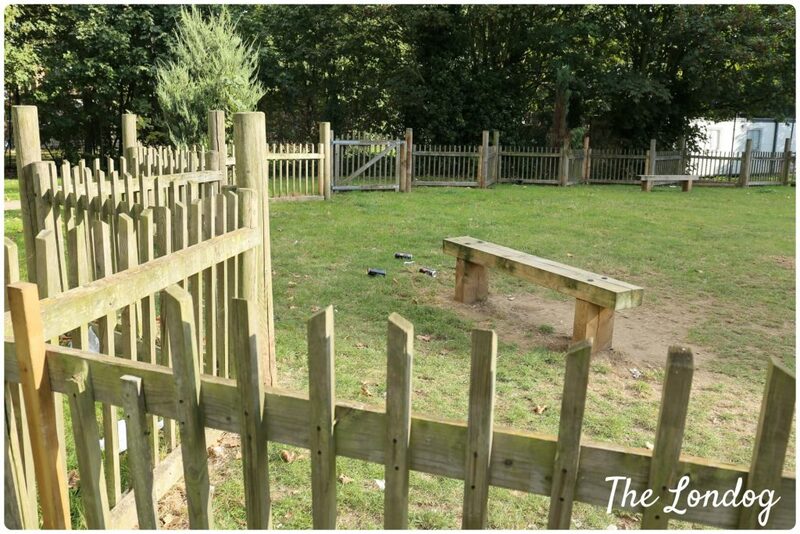 The smaller dog area has the same type of fence but does not have the additional stock fence. 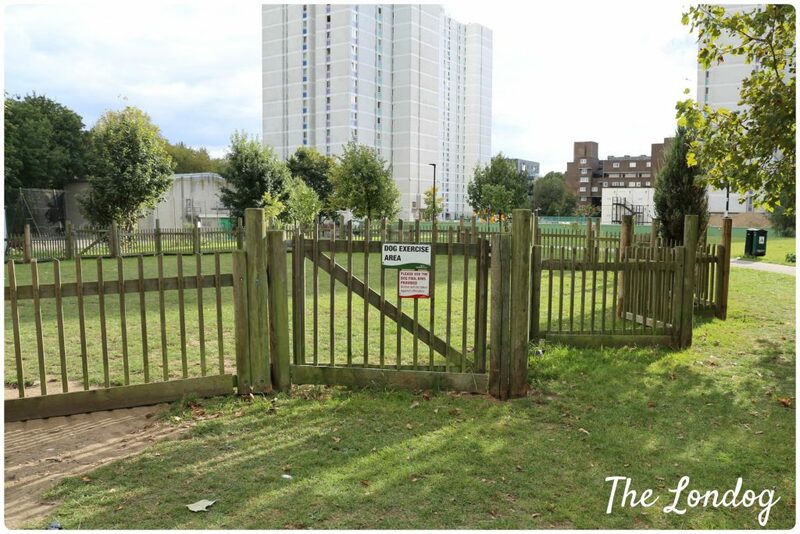 Eckington Gardens host a U-shaped dog exercise area, which has 3 gates, all closing well. The area is enclosed by a red metal fence with the rest of the Gardens and a high brick wall with the residential area behind. The metal fence is 104 cm high (approx. 40.94 inches) and is a very secure type of fence for small dogs since bars are 5 cm distant between each other (1.97 inches) with no gaps under the fence. 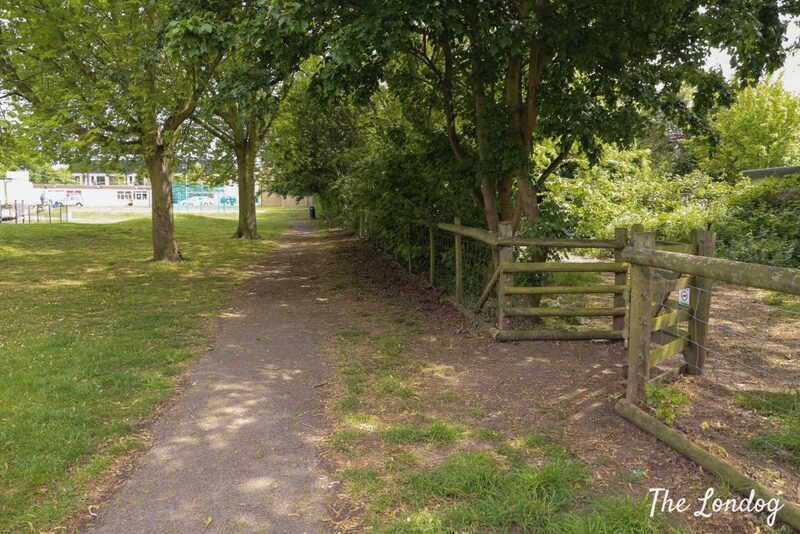 The area is provided with 3 waste bins and it is mainly well maintained, apart from a few undisposed dog mess near one of the gates. Under the middle gate there is a gap of about 15 cm (5.9 inches), and of 13 cm (5.11 inches) under the gate near the entrance of the Gardens. Probably the smallest dog exercise area we have ever visited so far, and we didn’t like it very much. We found it badly maintained and dirty, with unpicked dog mess and rubbish (even though you can’t really see it in the pics), and there is not enough space to have a decent run and play around. The area has one gate and the fence is made of green metal railings 120 cm high (approx. 47.24 inches), with space between bars of approx. 10 cm (3.93 inches). The dog exercise area, which has a very good size, has 3 gates on different sides. 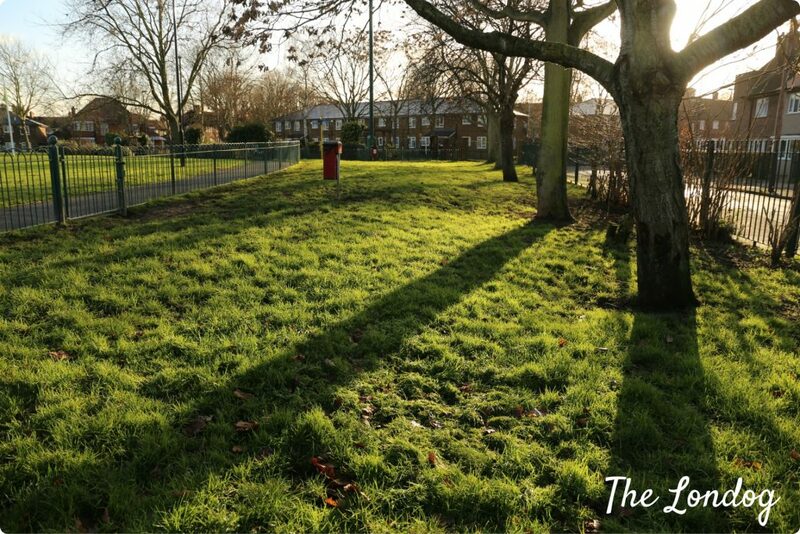 It borders with the gardens, a tennis court, a residential area and Quaggy river. The edges with the gardens and the river are enclosed by a rail fence approximately 120 cm high (47.24 inches), provided with stock fence about 50 cm high (19.68 inches), while there is a high brick wall on the boudary with the residential area and a high fence divides it from the tennis court. 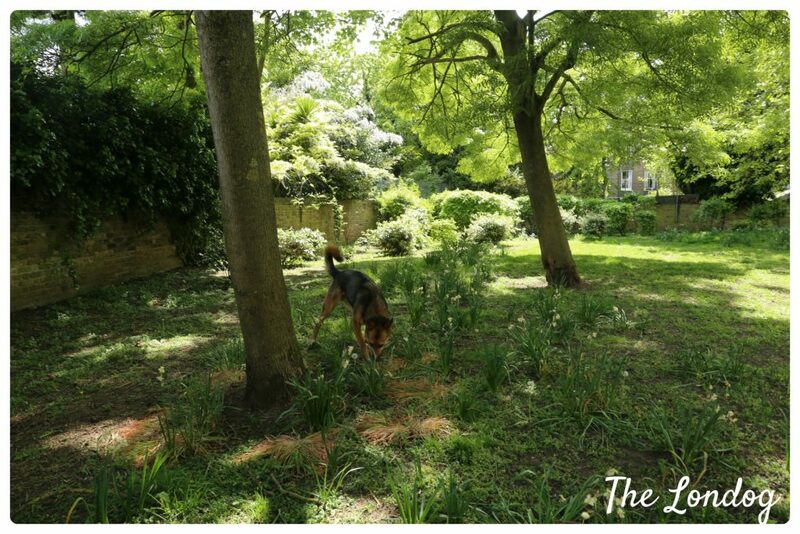 We visited Manor House Gardens in winter and the dog area was a bit muddy, but I am sure that in spring and summer they must be even more beautiful and have some more grass. When Argo and I visited the area there was a jogger who was running laps around the park and entered the dog area leaving the gates wide open several times (despite after the second time we kindly ask him to close it behind him). We really loved the dog area, however it is to consider that you can’t really keep all the three gates under control at all times and we found a few people passing through, to get to the other side of the gardens… therefore you need to be a bit careful (and this is why I would rate it four stars rather than five that I would have otherwise scored). There is also a driking fountain near the cafe of Manor House Gardens, so all you need is a bowl (I usually carry a collapsible one) without the need to carry your own bottle of water! The nearest train station is Bellingham. Bellingham Green dog area is small/medium sized. There are two gates and two dog waste bins. The fence with the rest of the Green is made of metal bars and is 97 cm/1 meter high (38.18/39.37 inches) with space between bars of 8 cm (3.14 inches), while the fence with the street measures 170 cm (66.92 inches) and the gap between bars measures 12 cm (4.72 inches). At the time of our visit, the dog area was full of undisposed dog mess and some rubbish such as beer cans here and there. 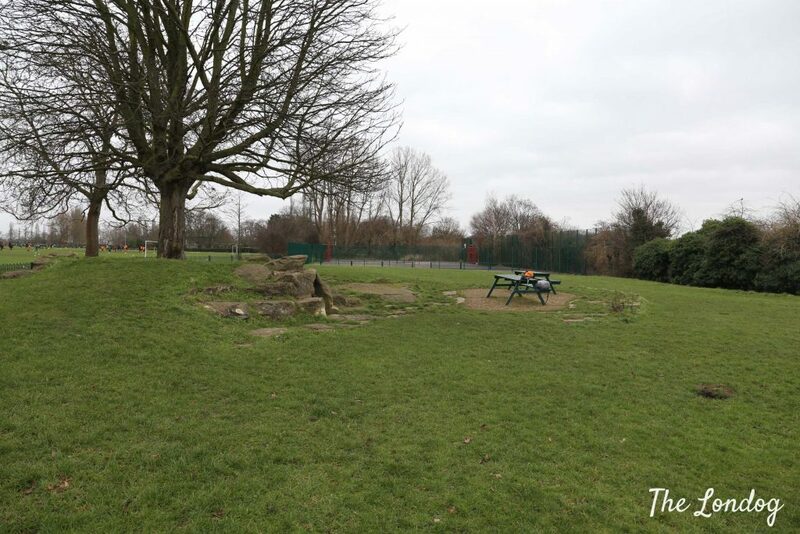 Edenvale Open space is an enclosed dog run which consists in a woodland path developing in lenght. 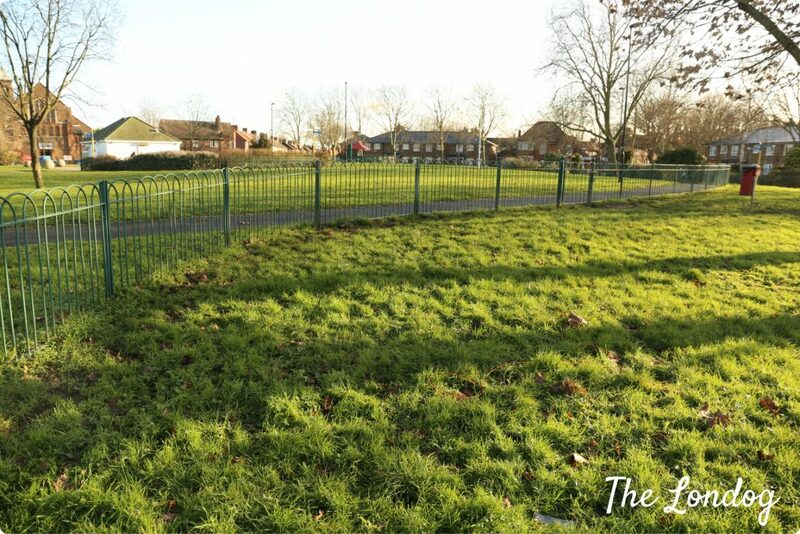 The fence on the side of the park is approximately 105 cm high and consists of a stock fence with a wooden frame. On the border with the street the fence consists of metal bars and is 130 cm high, with a gap between the bars of 10 cm. There are three gates, all on the side of the park, but you can’t see them all from inside the area. The only lock which was working at the time of our visit was the one of the nearest gate to the entrance of the open space. We also found that there was a gap of approximately 20 cm under the middle gate. The dog park was not greatly maintained in terms of cutting trees/edges and grass, although it was fairly clean. Thomas Wall Park dog exercise area consists in a very large lawn of L shape. 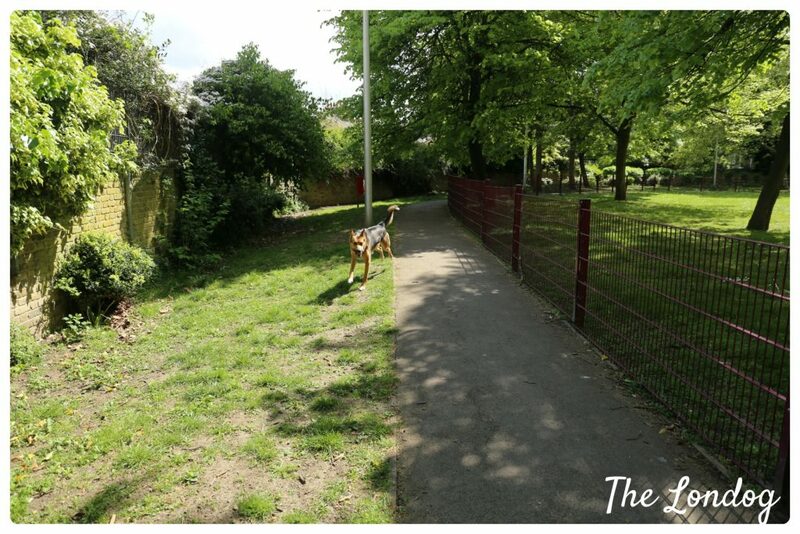 The entrance of the dog park is a bit hidden on Love Lane and you have to open the gate and take a narrow and dirty path between the park and the residential area before reaching the dog park. 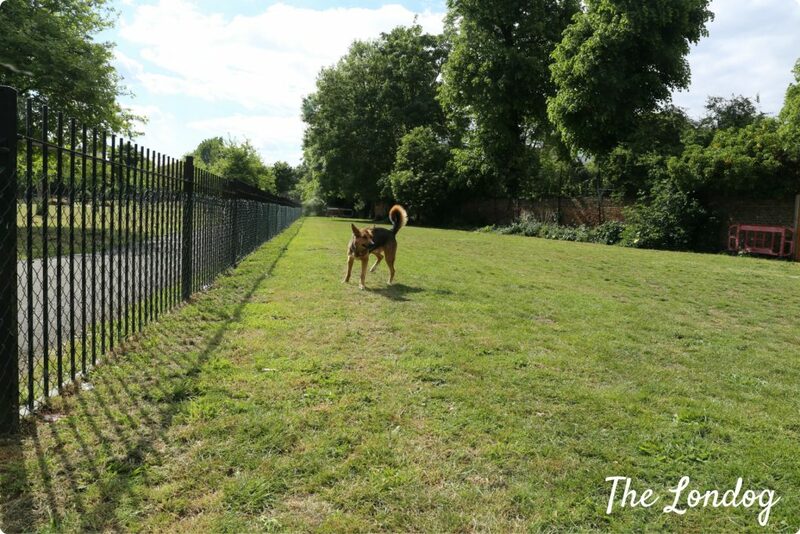 The dog exercise area is enclosed by a metal stock fence approximately 150 cm high. There are two gates: one on Love Lane (which lock works fine) and one with the park, under which we found a gap of 16 cm circa and a hole in the upper part. Watch out for some holes in the upper part of the fence too. Thomas Wall Park dog park has a great size, which makes it ideal for nice good runs and playing fetch. Apart from the “entrance corridor”, we found it clean and absolutely loved it. 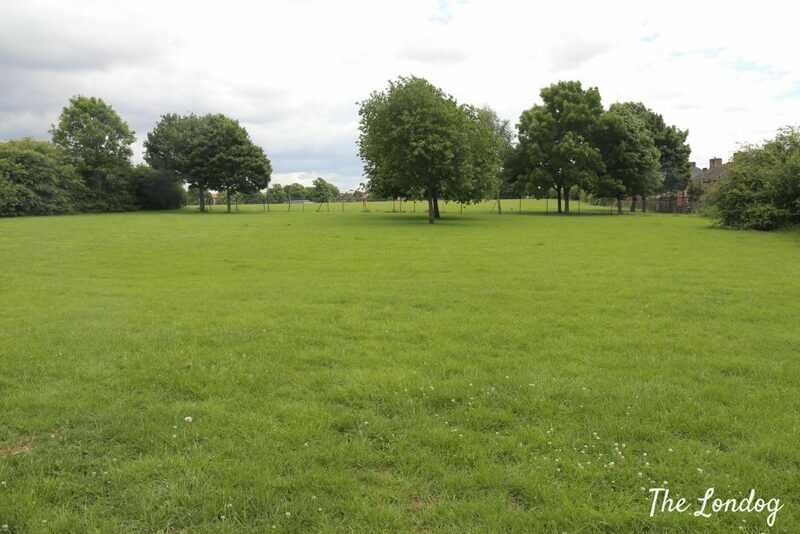 At Honor Oak Sports Ground you can find a large enclosed dog park, next to the tennis courts. The dog park borders with the cemetery and with the tennis courts on the shorter ends and with the ground on a longer side. The dog park has two picnic tables, a concrete tunnel under a little hill and one bin. There are two gates, both on the same side of the park. fence with the cemetery: metal bar fence approximately 210 cm high, with gap between bars of 9.5 cm circa and gap under the fence of 18 cm circa. fence with the tennis court: very high metal fence with very tight bars, over 3 m.
fence on the back of the dog area: metal bar fence, 150 cm high circa, with gap between the bars of 11 cm. fence with the rest of the ground: metal bar fence 85 to 96 cm high, with gap between the bars of 8.5/9 cm, circa 13 cm under the gate close to the tennis court. At the time of our visit we found the dog area fairly clean (there were just some rubbish probably taken from the wind) and well maintained. The only dowside, from a large dog owner perspective, is that the fence with the rest of the ground is too low, so your dog could easily jump over it (and you have to consider that people play football and do other sports in the rest of the ground). 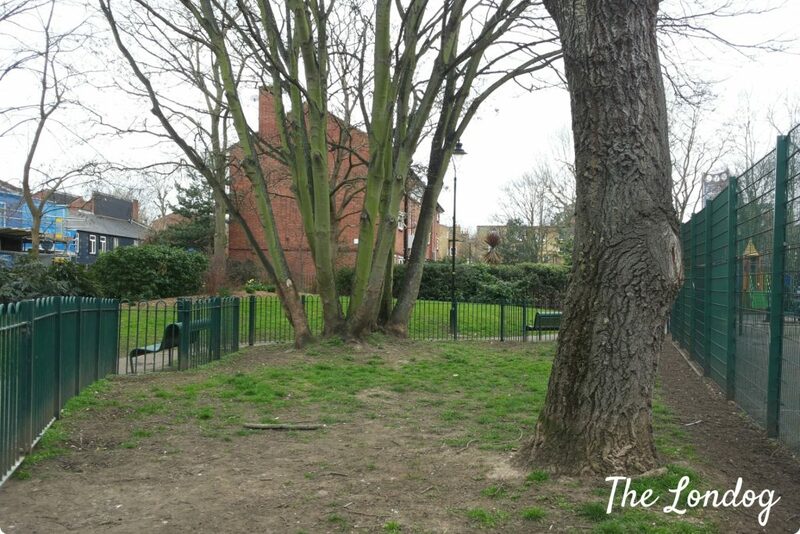 Small enclosed dog park in Bedford Road. Incredibly full of unpicked dog mess, basically a dog toilet. The area is enclosed by a metal bar fence 118 cm high, with gap between bars of 12 cm circa, and has two gates. In the area there is one bench, a bin and a dog waste bin, as well as an empty dog bags dispenser. Read the review in this blog post. Evelyn Green dog exercise area is a large fenced area on a hilly lawn, at the end of Childers Street. The fence is made of metal bars with a gap between bars of 10/10.5 cm circa and it is 120 cm high circa, with a higher fence in the back part of the area and on the border with the sports court. In some parts of the fence, the gap under it can reach 20 cm, so be careful with small dogs who may be able to sneak out. There are two benches and three dog waste bins in the area and a general bin. When we visited, we found that there were several used tires at the back of the area, near the fence behind which there was some mechanic. Overall, it has a decent size, although being on non-flat ground, if you throw a ball it can go all over the place. 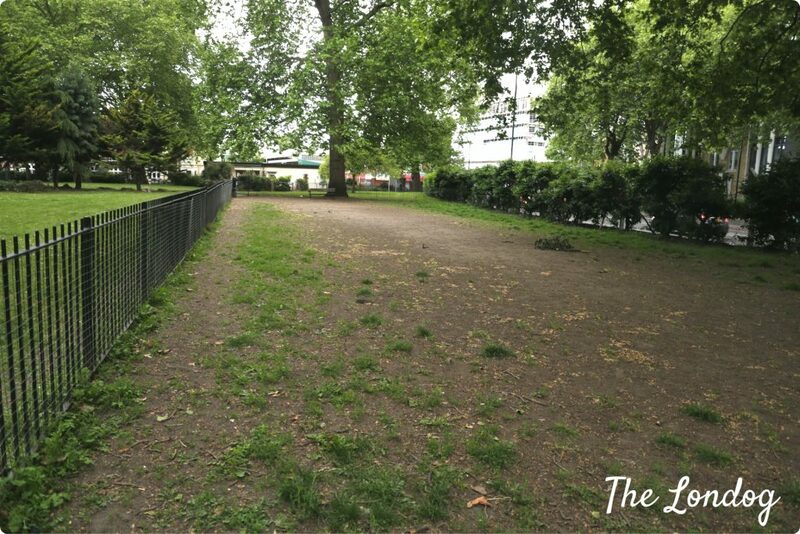 In order to make it easier to locate the nearest enclosed dog area, we have put together a map of all enclosed dog parks in London. You can navigate it to find the closest dog park to you on the Enclosed dog parks hub. Which green areas/ parks in the Camden/WC1/Kings X areas am I allowed to walk my dog? (on or off lead) (excl the dog parks, exercise areas etc already mentioned here). 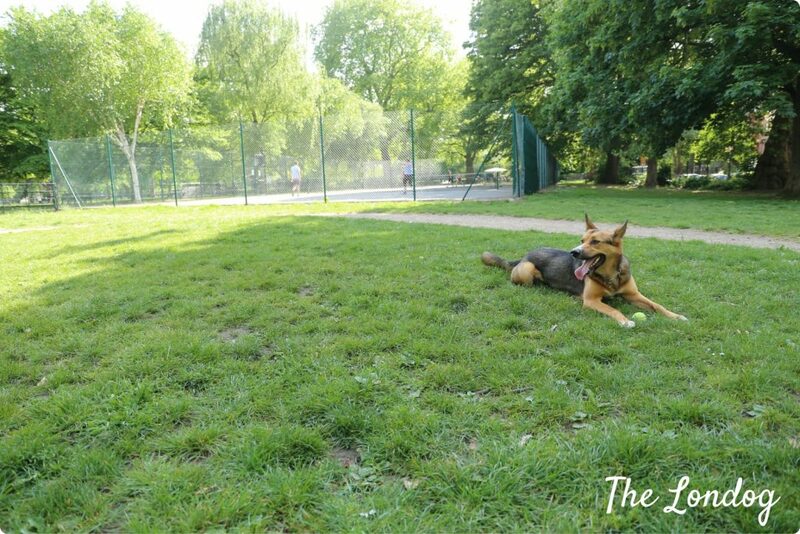 Regent’s Park and Primrose Hill are very beautiful places where to go and have a walk with your dog, if they are included in your area of interest. In WC1 here are also Russel Square Gardens (there may be a dogs on lead restriction there if I remember correctly) and Bloomsbury Square Gardens. On the contrary I know that dogs are unfortunately excluded from Coram’s Fields and Bedford Square Gardens. I don’t know about rules in other parks and open spaces, but I can have a look at this later. 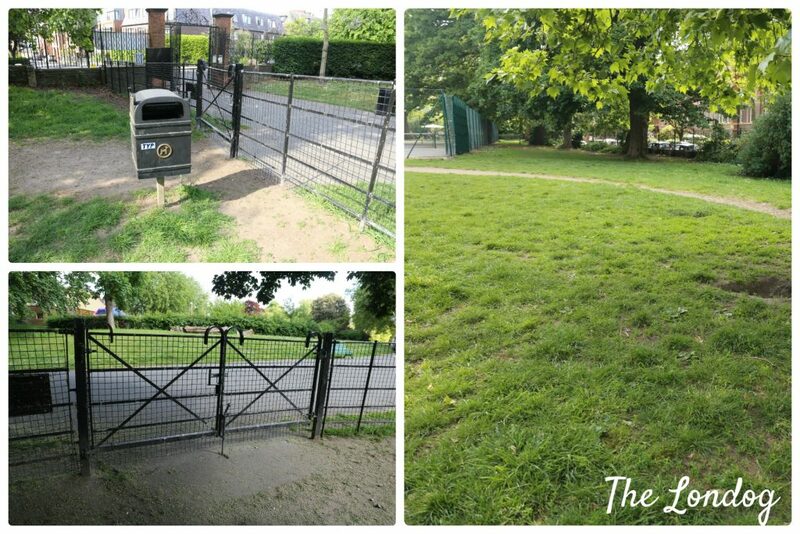 About dog access restructions in parks in the Borough of Camden in general, I know that last year the Council ran a consultation on dog access to public spaces, irresponsible dog ownership etc. in view of introducing a Public Space Protection Order (PSPO), but I am unaware of any follow up to this. Previous Dog Control Orders excluded dogs from accessing areas including the North part of Camden Square Gardens (but the south part is a dog exercise area), Chalcot Square Gardens, Primrose Gardens (South part), Fortune Green picnic area, as well as children’s play areas, fenced sports areas, multi use games sreas on housing estates, nature conservation areas, and flower beds and planted beds. I hope this is of help! Let me know if I can provide you with any other information. 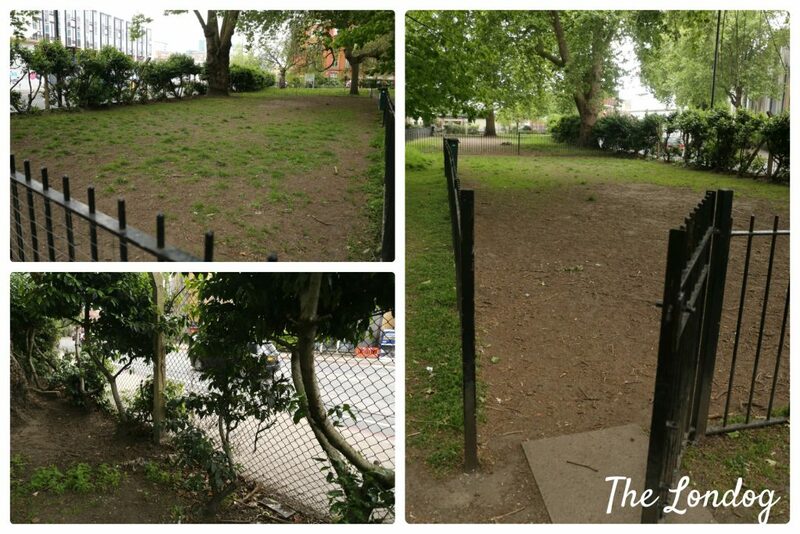 There is a small enclosed dog park on Judd Street, between Coram fields and Kings cross stn. many thanks for your message! Could you just confirm that you mean Hamilton Road as SW27 postcode? If so, unfortunately there is none at walking distance. 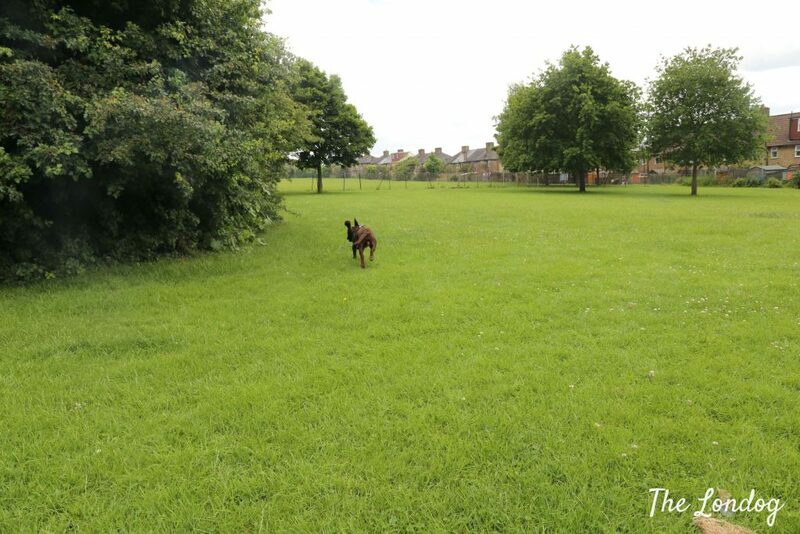 The nearest would probably be Edenvale Open Space (Mitcham, CR4 2DP), but nicer dog areas would be the ones around Camberwell. In particular I would recommend Slade Gardens in Stockwell, St Giles Churchyard, and Myatt’s Fields Park. I understand they are a bit far though. If you want to give it a try, I was told that there is also a fenced field just outside Cator Park (closer to you) where some people take their dogs, but is a private land so enter at own risk. I hope this is of help. Many thanks for all this useful info! 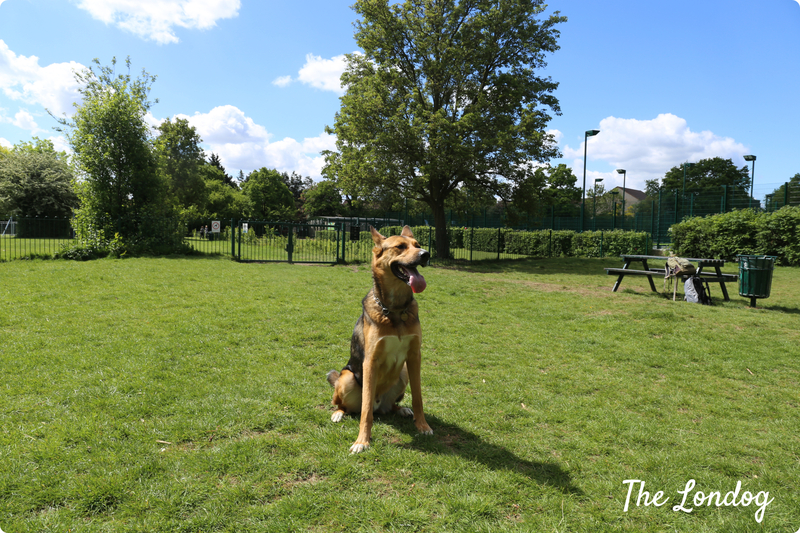 We went to Myatts Fields today for the first time on your recommendation and it was great for our dog and there was also a lovely playground for our daughter. 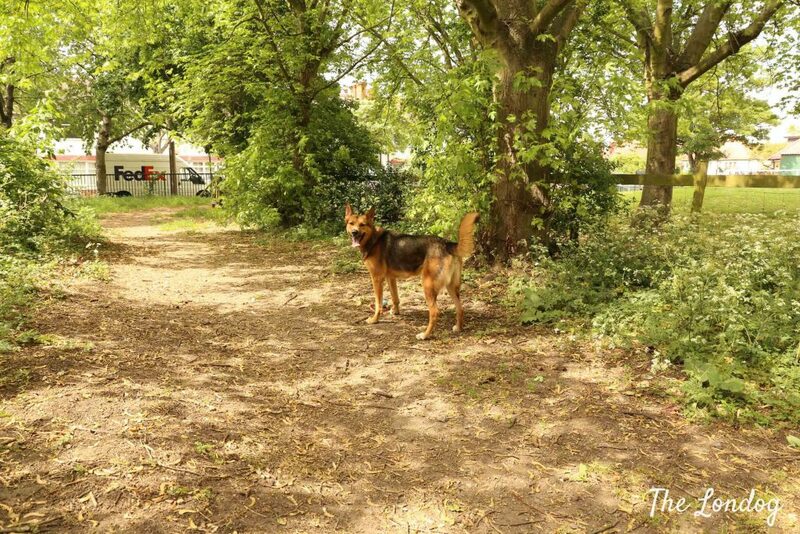 There is a dog park in Deptford on Friendly street too, if you are ever in the area. Very well enclosed. Hi Holly, thank you very much for your comment. 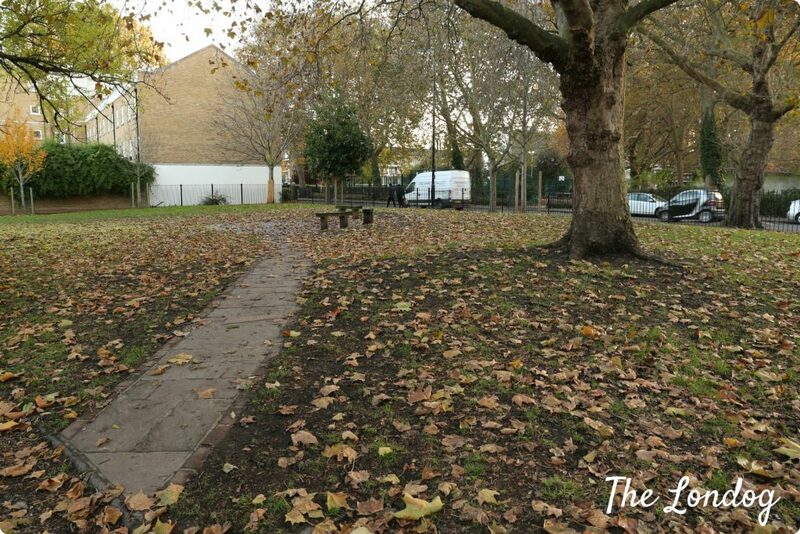 Is it the park just before Friendly Gardens coming from Deptford Bridge? Many thanks! Myatts Field was the best so far of the ones I’ve visited. The only downsize was lack of use. Only 1 other dog when I took my girl (she loves other dogs). Many thanks for your comment! If you want a more social one try and go to St George Square’s dog area in Pimlico: there are always many dogs there! This is such a great site, nothing as good as this online. As a Londoner with a hectic German Short Haired Pointer that loves to be outdoors, this website is a godsend. Very well designed, packed with great info for London doggie parents and great pictures. 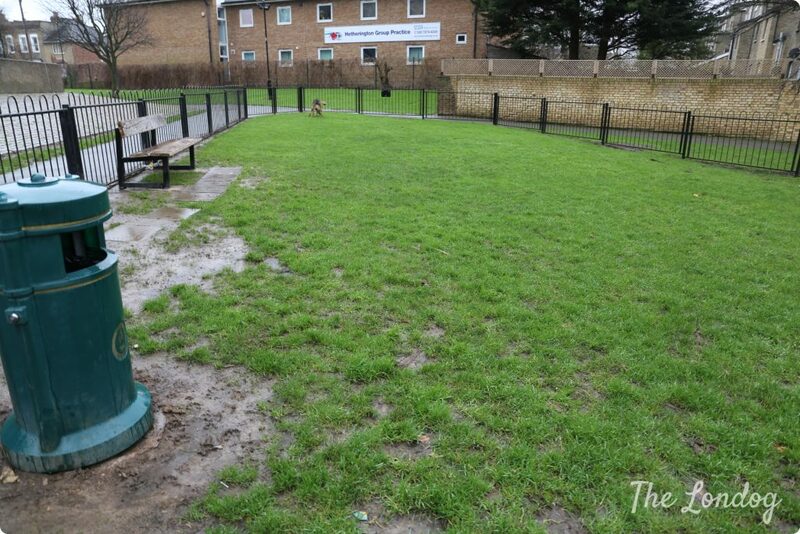 Secondly, are there more east London dog parks you haven’t reviewed? We made note of the two you have reviewed but would love to know if there are more around. Many thanks for your comment, it fills me with joy to know that this is proves to be helpful! 🙂 Yes, there are quite a few in East London, a guide covering them is on my to do list! I will be also releasing a map with all dog areas once the project is finished. In the meantime I will send you an email so I can suggest some other spaces and we can chat over there. Many thanks for putting this info together – very useful. My dog Bravo who is a shepherd cross looks like he could be related to Argo. He was found as a stray in Benidorm, Spain and ended up in London via a UK rescue centre. 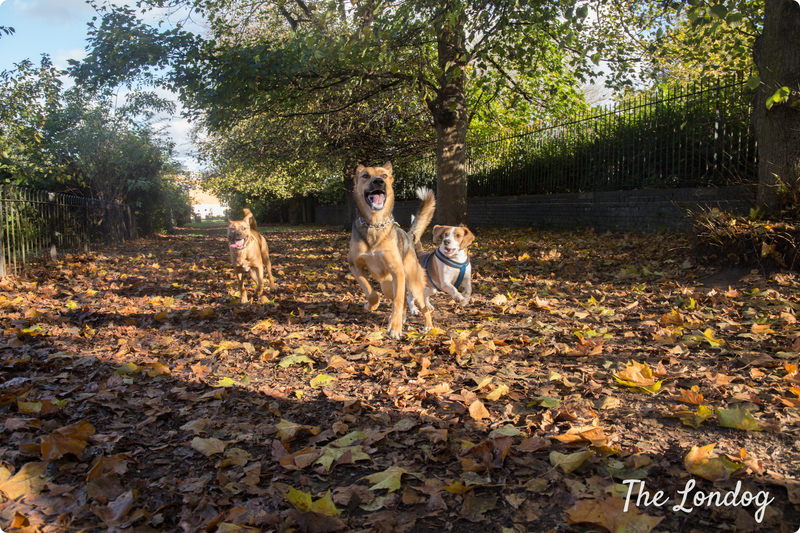 Question – in these dog walking areas, are there any rules? Many thanks for your kind message and lovely to hear that this information is useful! 🙂 Also lovely to hear that you have a fellow shepherd cross! Argo was rescued from Southern Italy by an association. To reply to your question, in the dog parks the main rule is picking up dog poo as in the rest of the park, for the rest not sure what rules you were thinking of. I would say always to respect etiquette when entering one and ask if a dog already in is ok with it, etc.